Established in 1974, Marievele’s Marquees now has more than 40 years’ experience in offering party and wedding marquees to hire to private, commercial and corporate clients. Marievele’s Marquees serves customers across Surrey, Essex, Kent and Sussex. The company prides itself on delivering a complete end-to-end service, providing not just marquee hire, but also associated core services like furniture, catering, heating, decorations, entertainment and floristry. 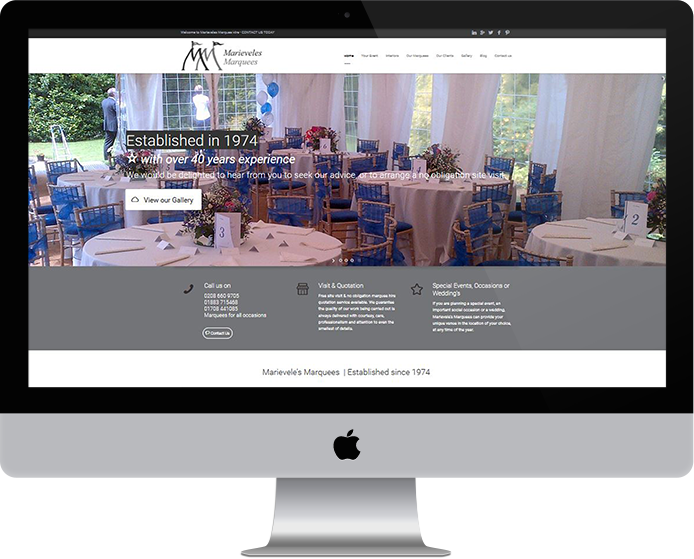 Our brief was to create a website with a fresh, modern feel that presented the marquees and services on offer in a very user-friendly way. It was clear to us that the website needed to support Marievele’s Marquees’ reputation for offering a friendly, personal and professional service. Therefore it was vital that potential customers could navigate easily around the site to find the information they were looking for. The client also wanted us to focus on search engine optimisation (SEO), targeting various keywords around different aspects of the business. The company already had a dedicated SEO and social media expert on their team, so we worked alongside them to deliver a website with an SEO-friendly CMS and content. This has led to an increase in visitors and business carried out through the website. The resulting website boasts a classic yet fresh and modern design, which perfectly showcases everything that Marievele’s Marquees has to offer, as well as boosting its SEO results.